Be Modern Group celebrate FSC® Friday with Toft Hill Primary School. 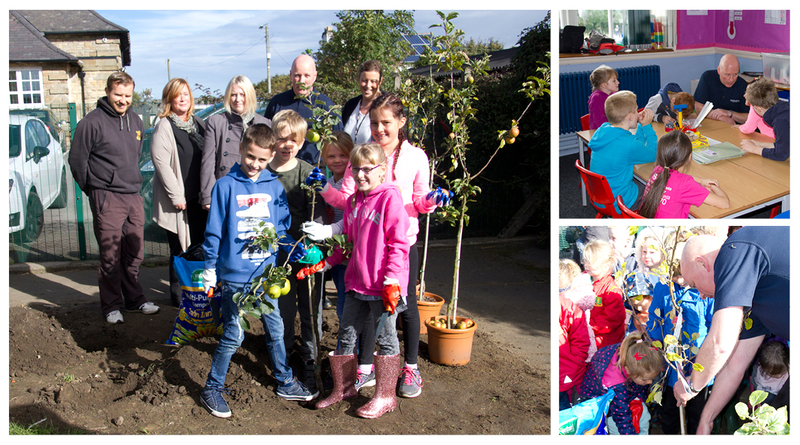 Be Modern were delighted to celebrate FSC® Friday with Toft Hill Primary School in Bishop Auckland on 30th September. The event rounded off a week of learning about the rain forest and sustainability by year 4 students lead by teacher Mr. Young. The children took part in lessons learning of the importance of FSC® and sustainability and the whole school gathered to help and observe four apple trees being planted in the school grounds. The trees will be looked after by members in the school’s gardening club, nurtured and monitored in the name of responsible forestry. The day was a great success with the students excited and engaged in their learning. Pencils and bookmarks provided by the FSC® were gratefully received by all 189 students of the primary school. Pledge certificates demonstrating an understanding of the importance of FSC’s work to protect the world’s forests and the wildlife that relies upon them were filled in by the pupils. “It has been a fantastic opportunity to collaborate with Be Modern to celebrate FSC® Friday. The children have had a fantastic day. We are so looking forward to seeing our new mini apple orchard grow” said Jancie Stobbs, Head Teacher of Toft Hill Primary School. Be Modern are proud to be an FSC® certified British manufacturer of bathrooms, bedrooms and fireplaces and are pleased to support FSC Friday with local schools to encourage learning and understanding of the organisation’s work.